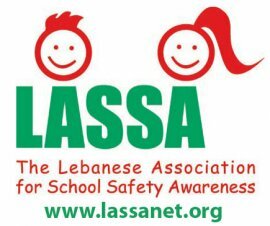 The Lebanese association for school safety awareness was launched in 2005 to help the educational institutions in school accidents’ prevention. LASSA is also member of YASA Group for Public Safety. - To promote school safety through the association’s services and guidance. - To help official and private schools through an individualized program. - To give seminars and presentations concerning school safety. - To launch awareness campaigns through media in order to reach all societies’ sections. - Transportation safety (pedestrians, buses and cars). - Building’s safety (Windows, stairs and playgrounds). LASSA and its members hope to improve the overall safety of schools through its specialized programs which cover all school safety domains. Our work varies from simple suggestions like lectures and orientations in order to reach a safety procedure applied in each school. We hope to reach our goals with the intention that we can provide safety for our children in their second home which is school. Bus drivers training in collaboration with YASA’s Driver Improvement Program (DIP) to provide children’s transportation’s safety. A guide for safe school transportation which take advantage of foreign countries’ experience. Promoting the use of seatbelts in buses. The application of strict conditions on construction licenses especially for nurseries and emphasizing on the importance of a continuous maintenance as well as penalties for the misapplication of security standards. The collaboration with the ministry of health to watch on hygienic conditions in all educational institutions. Requesting an accidents register and complaint box in each school in collaboration with a team from LASSA and Children Right. In addition of the constitution of a specialized medical team and providing first aid tools. Promoting public safety at schools through media and defending against violence phenomenon by the use of another punishment ways. Collaborating with nurseries’ syndicate to establish the security conditions concerning buildings, transportation and furniture in order to generalize it on all nurseries in addition of training for employees on first aid. Collaborating with the concerned parties such as ministry of education, parents committees, municipalities and police officers in order to put children’s safety on top of priorities. When the law # 551 will be implemented, the internal Security Forces will have a major role with the municipal police in enforcing safety rules and reguations on school transport. LASSA and YASA ask the Lebanese government to implement this law after around 14 years of its enactment. When the Lebanese Government will implement the Lebanese law about school safety law # 551 that was enacted in 1996? According to a new study in Lebanon, Only 54% of Lebanese knew the phone number 140 of the Red Cross. We invite LASIP and lassa to join efforts for raise the public awareness about this number.